At some point, you’ve probably passed a traditional cemetery and wondered about the ornate building(s) on the grounds. More often than not, that building is a mausoleum. It could also be a columbarium, or a combination of both. Here’s a quick look at where those terms came from and what they mean now. The National Funeral Directors Association defines a mausoleum as, “a building designed for above-ground placement of a casket. The casket is placed into a crypt that may be designed for one or two persons.” The building can include a single crypt, a chamber that holds a few people (such as for a family) or a combination of both. The mausoleum’s markers may be on exterior walls or the crypts may be viewed from inside a climate-controlled building. One of the original “Seven Wonders of the World” was actually a mausoleum. The Mausoleum of Halicarnassus was built in 353 B.C. near modern-day Bodrum in Turkey. It was the tomb of a Persian ruler named Mausolus. The structure was so grand and admired, the term “mausoleum” became the word used for tombs built above ground from that time on. 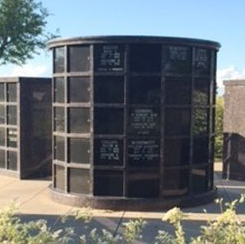 Columbarium comes from “columba,” the Latin word for dove, and originally referred to compartmentalized housing for doves and pigeons. When a structure was created with multiple niches to house what we now call cremated remains, it looked a lot like a columbarium, so the name stuck. Whether you want full-body burial (above or below ground), cremation where the remains are kept and preserved, or some other option, Local Cremation and Funerals is here to help. Please contact us anytime at 214-343-4060 and one of our team members will be happy to assist you in making preparations. Audra is a Licensed Funeral Director in the State of Texas, serving the Dallas area. Prior to Local Cremation and Funerals, she managed a funeral home as well as a funeral home/cemetery combination. Audra enjoys getting to know the families she serves to make their experience memorable and as stress-free as possible so they can focus on their family at the time of passing.